Information on farming, the community and visiting Tarset. Information and drawings by the children of Greenhaugh first school. Arts courses and supporter of local arts projects. Greenhaugh. Homely Northumbrian pub with real ale, food, accommodation, a roaring fire and a warm welcome. Kielder Sports offer clay pigeon shooting, archery, air rifle shooting, mountain bike hire and guided bastle walks. Northern Wilds specialises in wild food production in Northern England and is based in the heart of Northumberland National Park. Built by the Greenwich Hospital Commissioners in 1818 to provide a living for ex Royal Navy Chaplains after the Napoleonic Wars and under the CoE North Tyne and Redesdale team of parishes. Eco holiday settlement in Lanehead. Torture Trails is a 10k run over tough terrain and gruelling obstacles located in Tarset. The premiere manufacturer of artists' soft pastels in the world. Hand-made in Thorneyburn, Tarset. VARC funds and manages an artists' residency programme at Highgreen Manor, Tarset. Artist in residence 6 months to September 2005. Artist in residence 6 months to March 2005. Hill Farming - People, Animals and Landscape, 2004-2005. VARC special project (see Books below). Local weather from the automatic weather station located here at Gatehouse Cottage, Tarset. Wild luxury camping in tipis and yurts. Large agricultural show with country fair, ring events, trade stalls, entertainment and competitive events in nearby Bellingham. Traditional farmers show, including sheepdog trials, fell race and family activities. Music festival held on Brigantium Field in Rochester, Northumberland. The heritage of the North Tyne and Redewater. The roofless Black Middens Bastle House is accessible to tourists. MEP for North East EU constituency (Conservative). MEP for North East EU constituency (Liberal Democrat). MEP for North East EU constituency (Labour). Responsible for the 250 square miles of Kielder Forest in Tarset and beyond. Newly built observatory near Kielder Village taking advantage of the dark skies. See also the Kielder Observatory Astronomical Society. Keep notified of potential aurora borealis (or northern lights) events at Lancaster University Aurora Watch or Google Earth to view the current night sky. Tarset search of the UK's National Archives. Northumberland's unitary authority since April 2009. Gatehouse is located within the 405 square miles of the Northumberland National Park which runs from near Hadrian's Wall north to the Scottish Border. Farmers markets held throughout North East England. Where to stay, places to visit, things to do and what's on. The Regional Development Agency (RDA) covering North East England - Northumberland, Tyne & Wear, County Durham, Tees Valley. See also their "Passionate people. Passionate places" regional image campaign. Online community network for economic, social and environmental development in Northumberland. Member of Parliament for the Hexham constituency (Conservative). The photographs page on this web site. Includes work by photographer Kate Bellis (see Books below). Tarset search of Google's image catalogue. Gatehouse North Bastle, Gatehouse, Tarset (photographed in 1971). Heritage photographs from local communities in Northumberland including Bellingham, Falston and Kielder. Gatehouse North Bastle, Gatehouse, Tarset (photographed in 1967). Old ordnance survey maps and plans (see Photography above). Many small images of Northumberland maps from 1616 to 1920. A selection of books recommended by Tullie House about the border reivers (an old name for robbers or bandits) in the 13th to 17th centuries. Pevsner, N., Richmond, I., Grundy, J., McCombie, G., Ryder, P. and Welfare, H. (2001). Includes a good description of the bastles and those at Gatehouse. Work by photographer Kate Bellis and sculptor Sally Matthews on hill farming places, people and animals in Tarset funded by Visual Arts in Rural Communities (see Local community and business above). An account by Linda Gordon of her year spent as artist in residence (see Local community and business above). Data created by National Statistics for the Upper North Tyne ward including an area summary centered on postcase NE48 1NG. Socioeconomic statistics and research regarding Northumberland. English local authorities ranked by population density. January 2007 area and performance statistics produced by the Government Office for the North East. Extensive listings of websites in the North East of England. 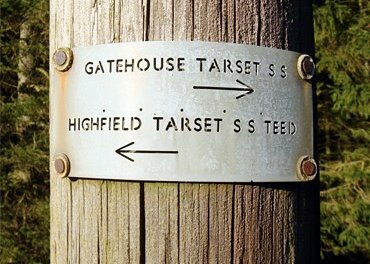 Growing list of links for "villages" such as Gatehouse, Greenhaugh, Lanehead, Charlton, Hesleyside, Donkleywood, in and near Tarset.